The Principle of Relativity: All the laws of Nature must be the same in every freely moving laboratory (reference frame), everywhere in the universe. It also states as a consequence that the speed of light is the same in all reference frames (as it must be for the laws of physics to be consistent). Which leads to time and space being all mixed up in a 4D spacetime. Applying relativity to Gravity was a grueling four years for Einstein but with the help of mathematicians he was able to finally give us what is STILL our BEST theory of Gravity (as quantum gravity has and continues to elude us). When we measure the speed of light at rest and in a frame of reference moving 200,000 km/sec we measure same speed. This Seems absolutely impossible. This is what always blew me away, if I am travelling 2/3 the speed of light and shine a flashlight, light is still the speed of light, which is THE SAME as someone on earth measuring it. How? We disagree about the lengths of things, we disagree about the duration of time that occurs, we disagree even for what it means for two events to be simultaneous. We disagree in ways that can be analyzed with Einsteins equations. At the simplest level when we look out in space, we are automatically looking backwards in time. You are NOT seeing the Universe or world "As it is". The moon is 1.3 seconds in the past (how long it takes light to travel). Light from the sun takes on average 8 minutes and 20 seconds to get to earth SO you are always seeing the Sun on average 8 minutes and 20 seconds in the past. When we are seeing a quasar a billion light years away we are looking into the past a billion years. ​Space , time and simultaneity relative. They are different for you if you are moving relative to me. They are different for you if you are in a different location in the universe than me. Relativity contains equations and ideas that connect what you observe and what I observe. 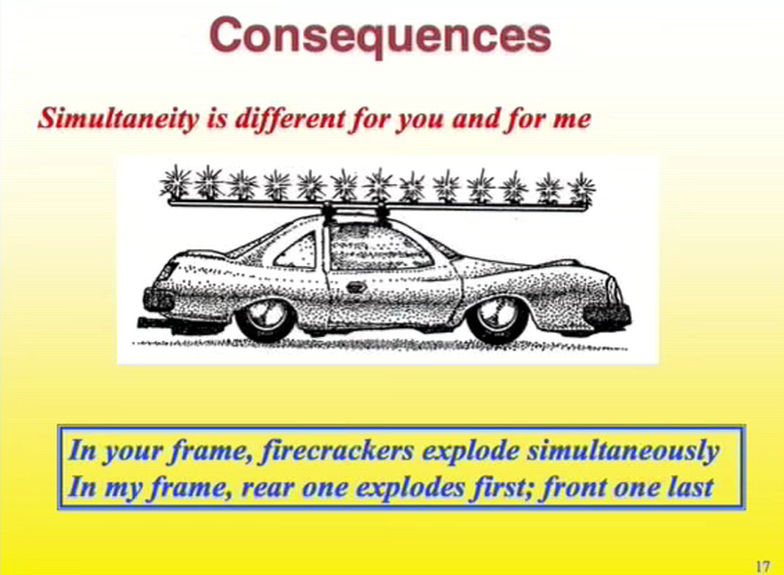 Space, time and simultaneity are relative or personal for people moving in different manners. All the laws of Nature must be the same in every freely moving laboratory/reference frame. At a deeper level space and time mixed in more complicated ways depending on the relative motions of observer and observed. Time and Space are Relative (or Personal)... You have your time and space and I have mine. They are mixtures of each other and depend how each of us are moving (and where we are).